Our Daily Deal today is truly a must-have for any Mom. 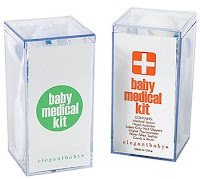 We like to call it Baby Care 101 in a box - everything you need to take care of baby's health needs in one handy place. We've reduced the price by 40% for today only, and only while stocks last. Simply click below for more information and to purchase. This all-in-one kit is packed with essentials necessary to keep baby in tip top health. 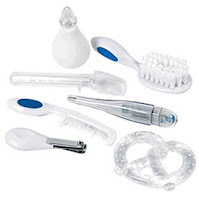 The kit includes a rapid-read digital thermometer, medical measuring spoon, nasal aspirator, water-filled teether for chilling, safety grip nail clippers plus a comb and soft bristle brush. A great gift for new moms. Equip her with all the necessities she may not know she needs. Packaged in a handy clear plastic case - perfect for everyday use and for travel.